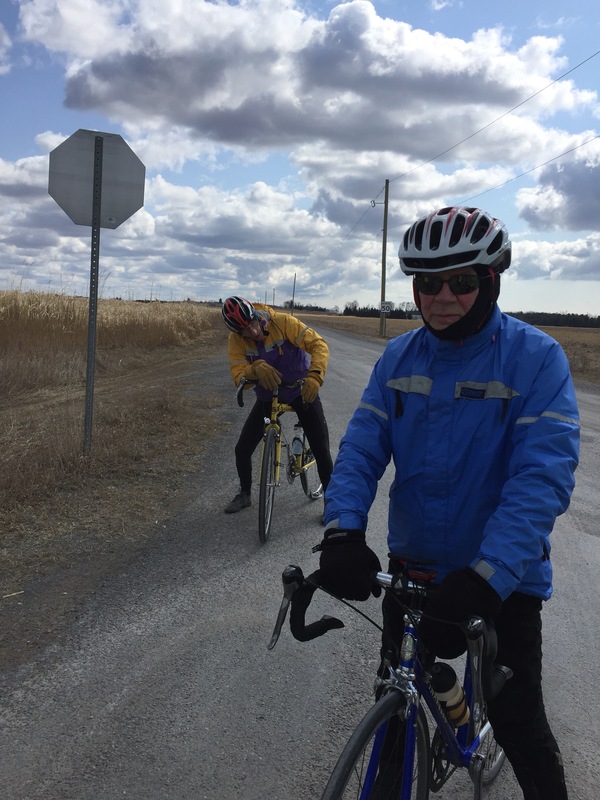 Eight fearless riders bundled up for Tuesday’s ride this week. Yes it was cold but so very worth it. We missed you! Next Tuesday, Klaus will host, starting from the Port Hope Town Hall. Route will be Le Tour de Cobourg. Options to avoid McEwen (along with Hill 60!) and/or Bickle Hill. In fact for those who would prefer to avoid all hills this early in the season there is always the alternative to just do an out and back between Port Hope and Cobourg along highway 2. Lunch will be at Nookies on Ontario Street across from the LCBO. By twocamels in Ride Reminders on April 11, 2018 . Me too. Once we get closer to the day, I will determine if there might be interest in doing the ride the following day…if the weather is good?? Although, I wouldn’t be able to do the lunch that day. I can’t do tues. due to a Therapy dog luncheon however if it switches to Wed. will be sure to make it. I”ll be there if the weather co-operates. Great picture. Is Richard having a nap? I will ride and stay for lunch if the weather cooperates. I think Richard is figuring out how to get his feet warm in the photo. I’ve pretty much decided that tomorrow’s ride is a “washout” but will post a final decision by 8:00. Wednesday is no longer an option for me. If there is interest (such as more than 5 or 6) in just Lunch at Nookies tomorrow (https://www.nookiesph.com/specials/) let me know and I can call and make a reservation. OK, not much of a surprise but today’s ride is officially cancelled. I just got back from driving most of it and the roads are wet, icy and dirty, especially the hilly bits. Let me know if a reservation for lunch is of interest to warrant a reservation. I am surprised that you would need to drive the route to call the ride off, Klaus. I would have cancelled it after looking out the window at my snow covered street. Hmmm..maybe there’s skiing again in the Forest! Did you go skiing, Brian? Thanks for trying Klaus. We will get on with other projects and maybe drag the wind trainers out. Good try Klaus. Our driveway is covered in ice with some snow on top. Lots of work to do today to get the drive cleared and cars on the road depending on things warming up a bit. Our Tuesday rides are all booked to the end of May. Please grab a date in June to try this particular ride again if your time allows it. Too funny Klaus……I skied this AM!